Data from the 2012 Census of Governments shows that in 2012, property taxes were the largest component of general1 local2 government revenues statewide and within 85 of Missouri’s 114 counties. In counties across Missouri, property taxes contribute between 10% and 70% to local general revenues. In 7 counties, the share of property tax revenues even exceeds revenues from inter-governmental transfers. Property taxes fund a variety of local government services across the state. The chart below shows how property taxes are distributed on average in Missouri. 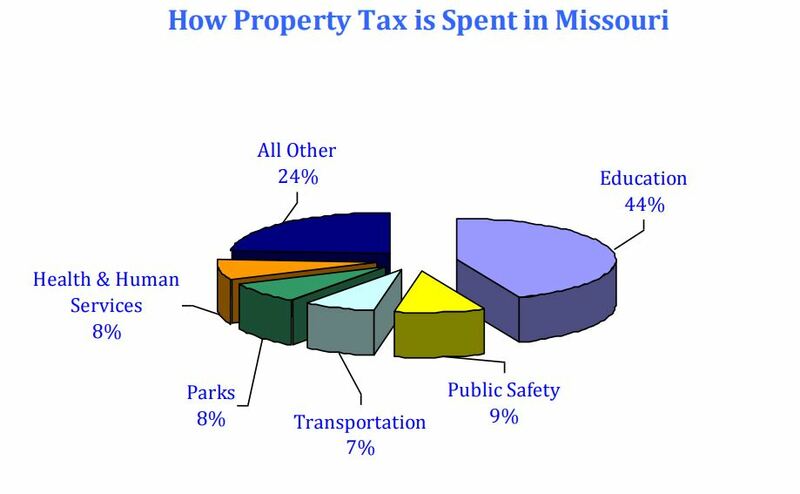 Services funded by property tax in Missouri. Missouri Budget Project Analysis of 2007 Census of Governments. In many counties across Missouri, heavy reliance on property taxes has created a situation where government functions are vulnerable to population shifts and property devaluation, and both central urban areas and rural areas in Missouri are affected by these trend. In core urban areas, demographic shifts have resulted in declining property values and population bases as both industry and populations have abandoned the central city for the suburbs. Meanwhile, population shifts to metropolitan/micropolitan areas, coupled with stagnant or declining agricultural property values have affected taxable property in rural counties and towns. Analysis of data from Zillow show that, in Missouri, real estate property values continue to grow at a slower pace than most neighboring states, and Missouri has not recovered from the 2007-08 housing market collapse as effectively as some neighboring states – median home values are still about 10% lower than they were at their peak in 2007. Yet Missouri boasts an average property tax rate (see map) of just 1.03%, just below the national average of 1.14%. 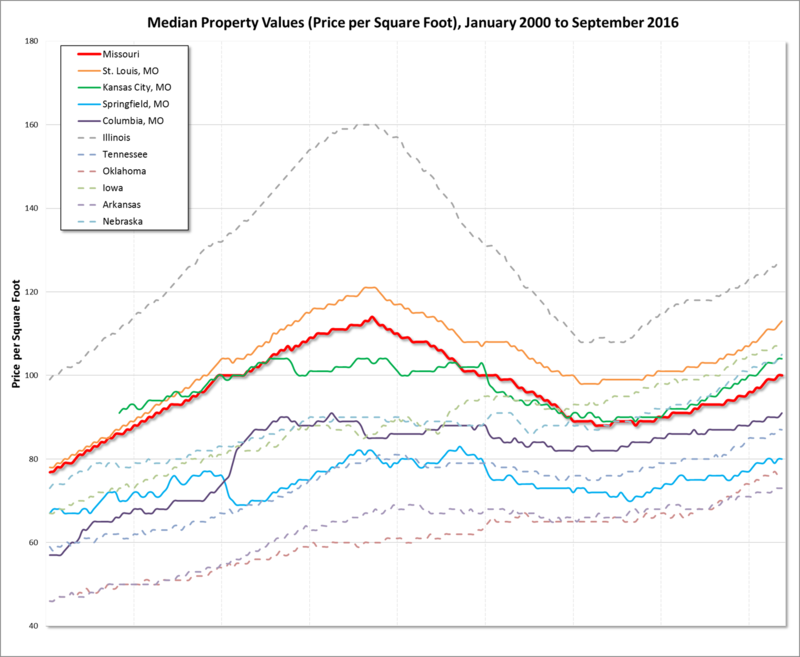 Median property value trends, 2000 to 2016. Zillow. Property taxes are also collected on agricultural land and equipment. 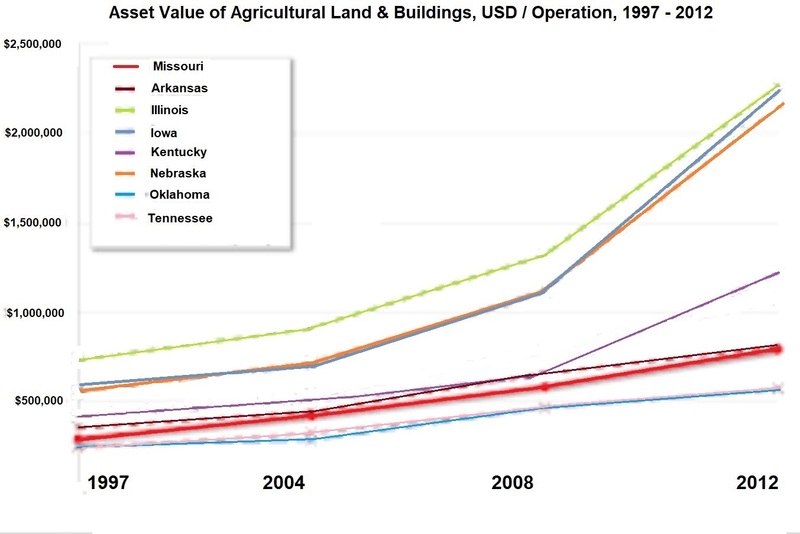 Time series data from the USDA Census of Agriculture show that here, too, Missouri lags behind its neighboring states and the US average in terms of growth and value per acre and value per operation. The charts below displays trends in agricultural property value between 1997 and 2012. 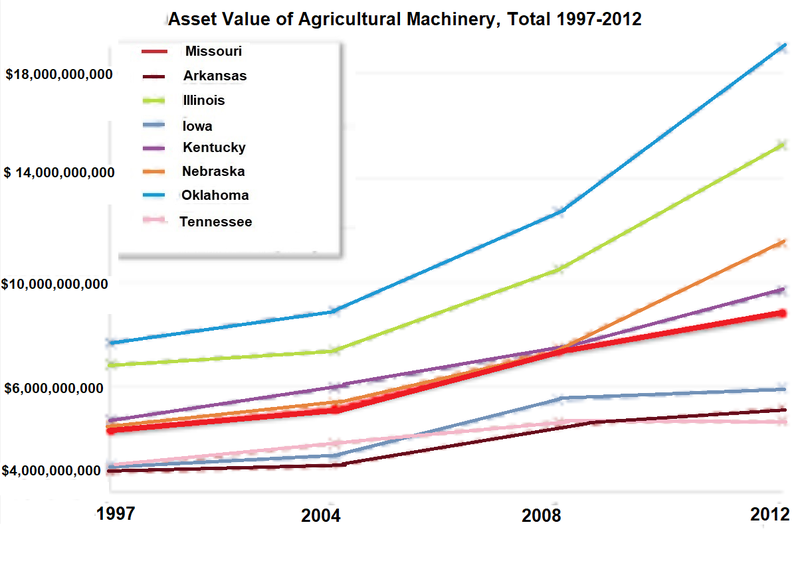 Agricultural Property Value Trends 1992 to 2012. USDA Census of Agriculture. General revenues include taxes, license fees, intergovernmental transfers, and charges. Non-general revenues include revenues from utility systems and the insurance trust sector. Local revenues are those collected by counties, cities, school districts, or special districts. Non-local revenues are those from inter-governmental transfers from the federal government, state government, or from external local governments.